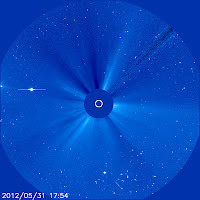 You can see Venus just coming into view on the left of this LASCO image from May 31. Over the next 5 days Venus will approach and disappear behind the occulter disk. On June 5 we will watch Venus move across the Sun in the telescopes of SDO. Watch the SDO images at VenusTransit.gsfc.nasa.gov, starting at 2100 UTC (5 pm ET). The bright dot between Venus and the Sun is Mercury. Next Tuesday SDO will witness a transit of Venus across the disk of the Sun. 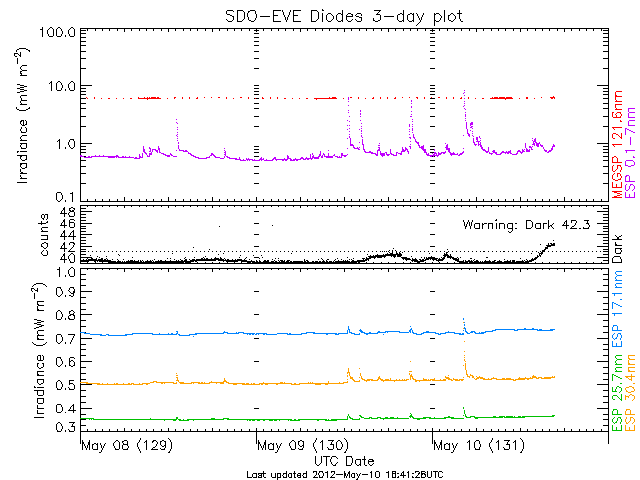 We will be producing a special set of data during the transit that allow us to check out the instruments on SDO, look at the Black Drop effect is several wavelengths, and see the atmosphere of Venus. AIA, the EUV telescopes on SDO, will see Venus against the corona about an hour before it touches the limb of the Sun. 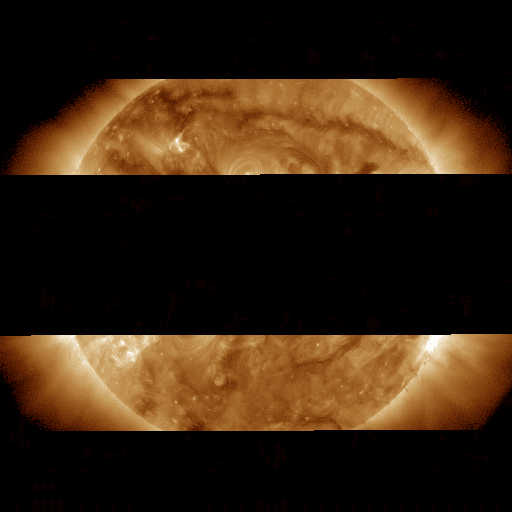 We have started showing test data on the SDO Venus Transit website. There is no disk in the test data but you can see what the movies will look like. Use your imagination to see the disk! Then come back next Tuesday (June 5) at 2100 UTC (5 pm ET) to see the real transit. AIA images are now current at the SDO website. Many thanks to those who worked on the weekend to fix this problem. Due to computer problems at Goddard, AIA images are not be updated at the SDO site. HMI and EVE images are current and AIA images are available at the AIA Science Team site. The problem is being worked and we hope for a speedy return to normal. Starting at 1700 UTC (1 pm ET) today and lasting until 0300 UTC tomorrow (May 25, which is 11 pm ET May 24), we will be running a simulation of the observations to be taken during the Venus transit on June 5. AIA will be switching modes to take different sequences of images to allow the scientists to study the instrument and Venus. HMI will try out its transit mode as well but will return to normal operations after about an hour of special mode. AIA will be taking three types of images during the test and transit. Every 96 seconds it will take a set of full-disk images. In between it will provide partial images (cropping out the southern polar region) at the usual cadences and striped images at extremely high cadences. 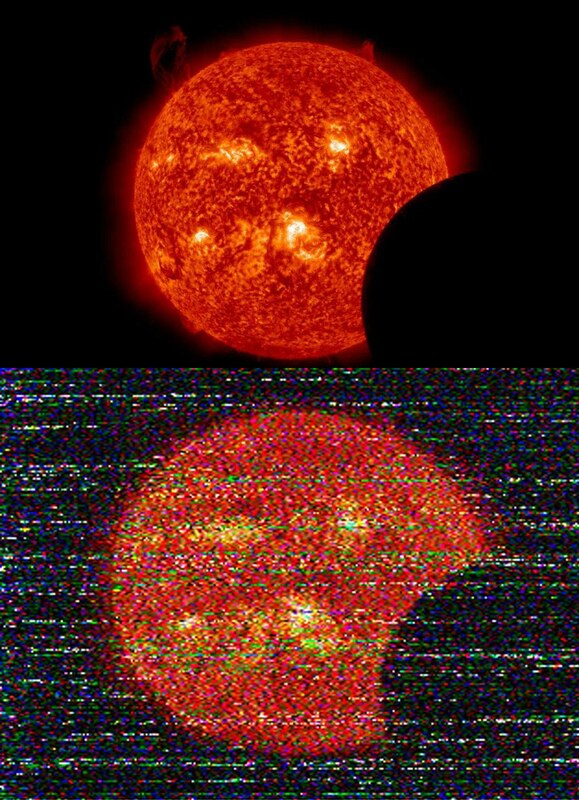 Examples of these images are at left that were taken during a shorter test held May 23 between 1900 and 2015 UTC. During the transit we will be providing movies of images taken during the transit at http://VenusTransit.gsfc.nasa.gov. The SDO browse data service are back up. http://sdo.gsfc.nasa.gov/data/kiosk.php and http://sdo.gsfc.nasa.gov/data/aiahmi/ are now back online. 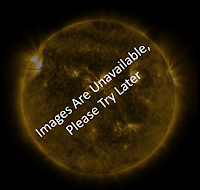 There is a temporary interruption in the service of browse data on the SDO website. 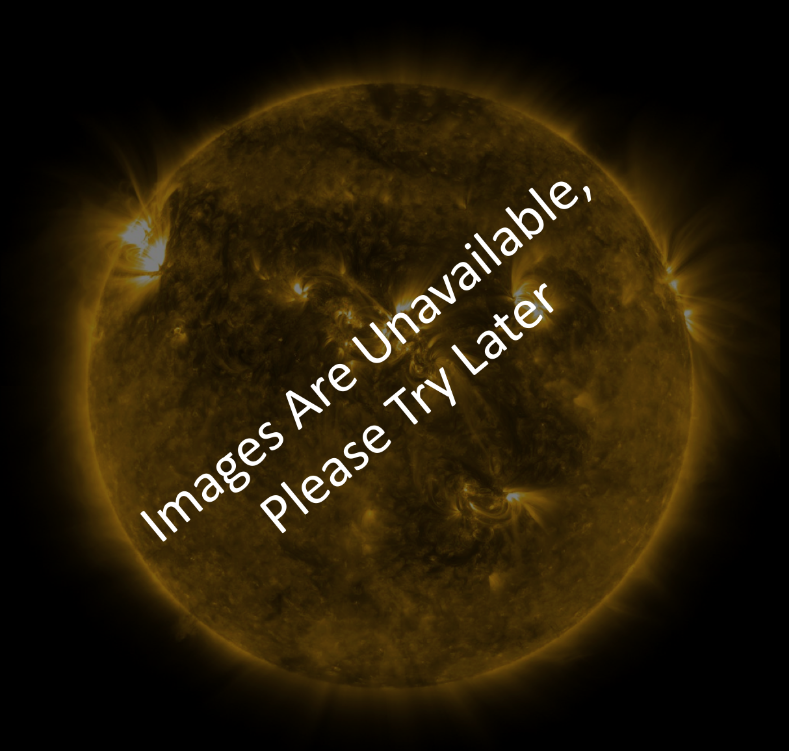 http://sdo.gsfc.nasa.gov/data/kiosk.php and http://sdo.gsfc.nasa.gov/data/aiahmi/ are temporarily offline. We are working to get it back up as soon as possible. Today, tomorrow, and Thursday we will be running tests of the Venus transit image sequences. During these tests the AIA images may be partial images or even striped images. These are designed to send data more suitable for studying the effects Venus will have on the data. Please be patient while we explore new ways to use the instrument. Today at 1800 UTC we will perform our 10th momentum management (Delta-H) maneuver. Data will unavailable from the SDO instruments from 1800 until 1824 UTC (2:00-2:24 pm ET) while the thrusters are fired to change the reaction wheel speeds. Reaction wheels are used to keep SDO very accurately pointed at the Sun. These burns keep the reaction wheels within their speed limits. How Big are Today's Sunspots? As we move through solar maximum in the solar north we can start comparing Solar Cycle 24 with other data. 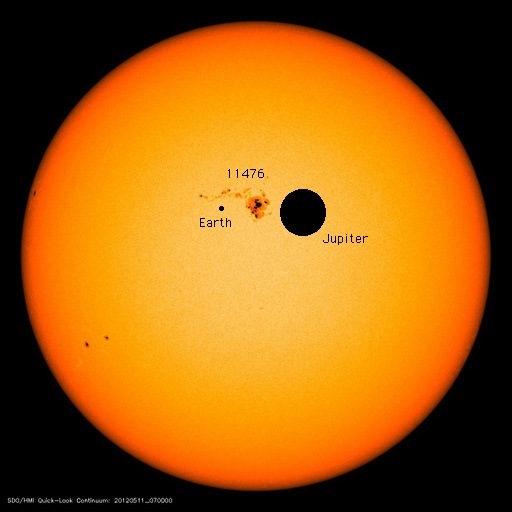 Here is a comparison of the active region 11476 in an HMI image from May 11, 2012 with the Earth (small dot) and Jupiter (big dot). AR 11476 covered about 1100 area units at its largest size. People claimed it was as big as Jupiter! We can see here that the dark core part of 11476 (called the umbra) was still quite small. Even though the entire sunspot was about half the size of Jupiter, it is mostly the dimmer penumbra. 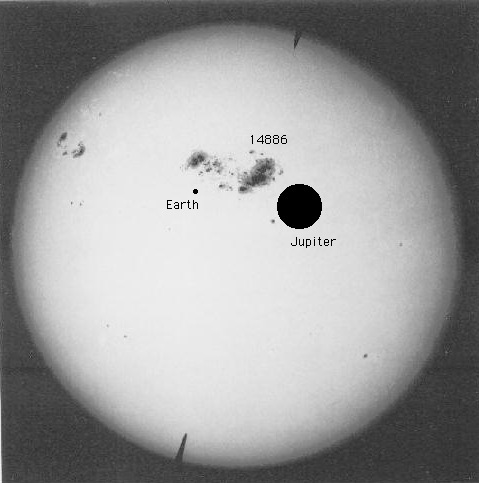 Compare with the largest sunspot we have in a photograph, AR 14886 from April 7, 1947. We put the Earth and Jupiter disks in again and see that AR 14886 is larger (6000 units) than AR11476, still a little smaller than Jupiter (which is 10,000 units), and the dark umbra appears to occupy a larger fraction of the sunspot. (Original picture is courtesy of the Carnegie Institution of Washington.) One of the largest sunspot in Solar Cycle 23 was 10486, which caused the massive Halloween storms of 2003. It was 2600 units at its largest. The largest sunspots tend to occur after solar maximum and the larger sunspots tend to last longer as well. As we move through solar maximum in the northern hemisphere and look to the south to pick up the slack there should be plenty of sunspots to watch rotate by SDO. CHECK IT OUT: SDO images are featured in the June issue of National Geographic! Still Active in the North, AR 11476 Flares Up! The SWPC in Boulder issued a flare alert after an M-class flare in active region 11476. Here is an EVE plot from noon today showing the history of spectral irradiances. We usually look at the blue line in the top panel, the ESP 0.1-7 nm radiometer. It is very similar to the GOES X-ray measurements. The M-class flare is the spike in the blue line just after 0400 UT today. 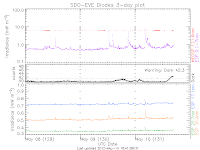 The dark count is a measure of the energetic particles hitting SDO and usually rises around 1800 UT each day because of the Earth's radiation belts. Potential Impacts: Area of impact centered on sub-solar point on the sunlit side of Earth. Extent of blackout of HF (high frequency) radio communication dependent upon current X-ray Flux intensity. For real-time information on affected area and expected duration please see http://www.swpc.noaa.gov/drap/index.html. 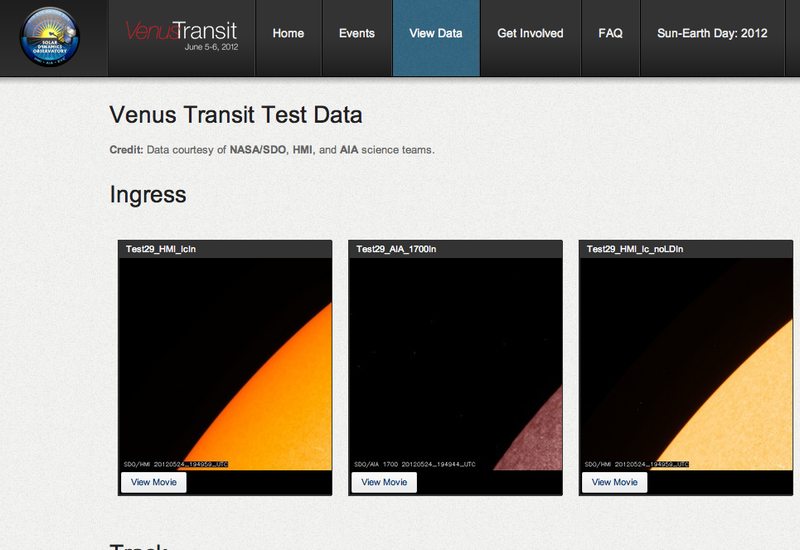 The AIA Venus transit testing is over and images are flowing to the various archives. Today at 1800 UT (2 pm ET) the AIA instrument started testing the instrument modes they will be using during the Venus transit on June 5-6. AIA images will be unavailable until the testing is complete (about 30 minutes). Some of the partial and striped images may be visible. There is nothing wrong with AIA and we will return to our normally scheduled pictures as soon as the testing is finished. Some pictures from SDO go the long way 'round! Here is an AIA 304 image taken during the April 21, 2012 lunar transit and the same image sent to the moon, reflected back to the Earth and reconstructed by Daniela de Paulis back on Earth. I wonder if this is what the SDO images would look like if they were received by someone on Polaris? The striping in the lower image is visual static. It is what the hiss between radio stations would look like if you made it into a picture rather than listened. I do wonder why the noise has blue dots. More information about sending images to the moon and back can be found the OPTICKS website. The NOVA special Secrets of the Sun that ran Wednesday night is now available for streaming at the PBS website. 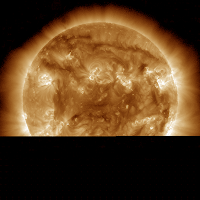 You can still watch SDO data and scientists talking about the Sun and how it affects us. The stream at WGBH is only a preview.